Milford junior Colby Pires has been selected as the HockomockSports.com Player of the Week, presented by Morse Insurance, for Oct. 1 through Oct. 6. Pires is the fifth player chosen as Player of the Week for the 2018-19 school year. Pires and the Milford offense found their footing on Friday night against Sharon in a 42-7 win, earning the Hawks their first victory of the season and opening their league account this fall. 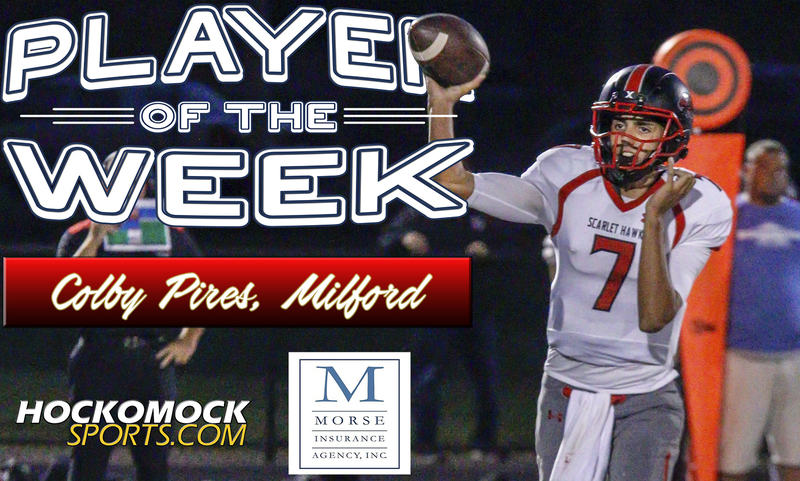 Pires was the star for the Hawks, tossing four touchdown passes and throwing for over 200 yards to get Milford into the win column. He went 13-for-16, hitting touchdown passes of 13, 25, 37, and 51 yards. He had three different receivers (Sean Lehane, Brendan White, Hugo Lopes) catch a touchdown pass. Pires completed 17-of-26 passes on the night. He threw a pair of touchdowns to Sean Lehane (who also caught one the week before) and one each to Hugo Lopes and Brendan White. Coming into the Sharon game, Milford had scored 40 points as a team and with Pires leading the way eclipsed that total on Friday alone. The junior signal caller is now the league leader with nine touchdown passes on the season, two more than division rivals Johnny Hagan and Nick Raneri.